NETWORK FINALS: There were no changes from the preliminary Wednesday ratings. CABLE HIGHLIGHTS: Although FX’s AMERICAN CRIME STORY: THE ASSASSINATION OF GIANNI VERSACE led Wednesday cable, its 0.72 was a shadow of the 1.96 premiere for THE PEOPLE VS OJ SIMPSON 2 years ago. VH1’s BLACK INK CREW was steady at 0.65. ESPN’s NBA doubleheader was at 0.59/0.47. Bravo’s REAL HOUSEWIVES OF NEW JERSEY gained 0.04 to 0.53. On History, VIKINGS slipped 0.03 to 0.51, and KNIGHTFALL ticked down to 0.22. On TLC, MY 600-LB LIFE dipped 0.02 to 0.46, and FAMILY BY THE TON was down 0.07 to 0.29. On Freeform, the newly-renewed GROWN-ISH jumped a tenth to 0.40 (and not surprisingly was strongest in the F 12-34 demo, where its 0.55 put it behind only BLACK INK CREW for the night), and ALONE TOGETHER remained at 0.17. TBS’s FULL FRONTAL rose 0.06 to 0.40. MSNBC’s RACHEL MADDOW SHOW notched another cable news win at 0.38/0.56/3.1M, over Fox News’s TUCKER CARLSON TONIGHT at 0.27/0.46/3.1M and CNN’s ANDERSON COOPER 360 at 0.24/0.42/1.2M. MTV’s CATFISH dipped 0.03 to 0.37. On HGTV, PROPERTY BROTHERS climbed 0.05 to 0.37, HOUSE HUNTERS was steady at 0.32, and HOUSE HUNTERS INTL was up 0.03 to 0.29. OWN’s IF LOVING YOU IS WRONG ticked up to 0.37. On E!, TOTAL DIVAS rose 0.09 to 0.30, and WAGS was down 0.03 to 0.11. On ID, SEE NO EVIL premiered at 0.30, and HOMICIDE HUNTER was down 0.04 to 0.29. 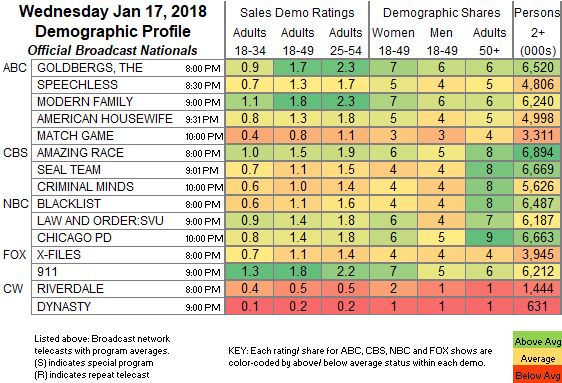 On Lifetime, LITTLE WOMEN grew by 0.06 to 0.29, and TERRA’S BIG HOUSE was up 0.05 to 0.20. On Syfy, THE MAGICIANS ticked down to 0.29 and HAPPY ticked up to 0.19. TNT’s THE LIBRARIANS held at 0.27. Food Network’s GUY’S GROCERY GAMES was at 0.27. 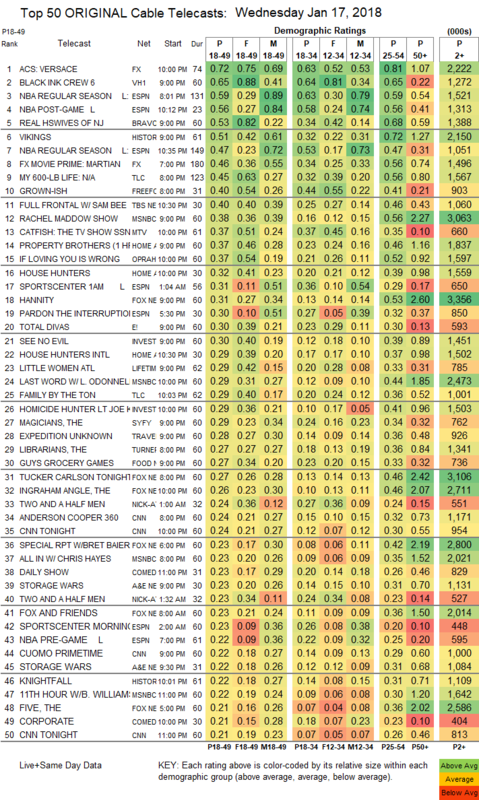 On A&E, STORAGE WARS was at 0.23/0.22, compared to last week’s 0.26/0.25, and ROOSTER & BUTCH was up 0.02 to 0.16. Comedy Central’s CORPORATE premiered at 0.21/0.17.